But first, a bit of background on how Linda was feeling when she entered the Turbulence Training Transformation Contest. Linda had a tough holiday seasons, again, like most men and women, and ate too much while exercising too little. So she resolved to change. She heard about the transformation contest and knew it could give her the freedom she wanted and the power to overcome food and fitness struggles. One of Linda’s secrets was certainly her goal setting. In fact, if you join the contest and set your goals – and review them regularly – you’ll achieve outstanding success and transform your body and your life. Goal setting is such a powerful, yet simple little tool to help you lose fat, and frankly, achieve almost anything you want in life. Linda’s 2nd secret to success was taking measurements of every body part. Not enough transformation contest folks do this, and they regret it later for many, many reasons. First of all, after Linda’s transformation, she now had many different ways of looking at her improvements. So she could reflect back on how her thighs decreased, and how her body fat plummeted. But if she didn’t take those measurements, she’d only be guessing at how well the program worked for those areas. And just as important, her measurements helped keep her motivated over time. The info continued to inspire her as she lost fat week by week, and she was always able to set new goals based on past measurements. Plus, if the measurements were not changing, it simply meant she needed to change her program or diet. That is essential feedback! So take as many measures as you can. Linda’s 3rd secret to success was her rigorous planning of the 12 week body transformation contest period. Most fat loss folks don’t think ahead and plan for social outings or all of the obstacles that are going to come up in the next 12 weeks, and because they are unprepared, they fail to deal with these problems. And as a result, they do not lose belly fat. But Linda planned, looked at her schedule, and worked around social outings so that she continued to transform her body no matter how hectic life was for her. Linda’s 4th secret was her perception of the journey. She didn’t take things to the extreme. She focused on balance, not perfection. As part of her plan, she knew there would be a few small mess-ups, but overall she knew that if she could stick to the plan 90% of the time, she would lose a lot of fat and change her body forever. Her transformation training workout programs consisted of the intermediate Turbulence program followed by the extremely popular TT 2K4. (Both available in Turbulence Training for Fat Loss).But most importantly, she even started with the beginner program, as you should if you have not worked out in a while – or ever before. Train safe! She combined those workouts with Eat Stop Eat to lose 28 pounds of fat and 7% body fat in just 12 weeks. Amazing results. Linda boosted her confidence, regained her freedom from body fat, and increased her all-day energy levels. Plus, she crushed all food temptations with her new lifestyle, and never once felt deprived. This was a complete body transformation and powerful success story. 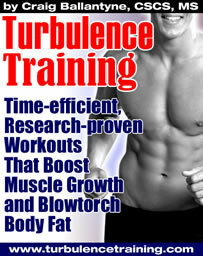 PS – Click here to get started in the next Turbulence Training Transformation Contest.